Truthbomb Apologetics: Does John 4:23 indicate that only God the Father -and not Jesus- is to be Worshiped? John 4:23 quotes Jesus as saying, "But an hour is coming, and now is, when the true worshipers will worship the Father in spirit and truth; for such people the Father seeks to be his worshipers" (NASB). As Norman Geisler and Ron Rhodes explain in their helpful book Correcting the Cults, Jehovah's Witnesses believe that only the Father is to be worshiped. They believe that Christ should be shown "obeisance"1 or reverence, but nor be worshiped. Most interestingly, as Matthew Slick argues here, the Watchtower Organization at one time taught that Jesus should be worshiped! 1. Watchtower, 15 February 1983, 18) as referenced by Geisler and Rhodes. 2. 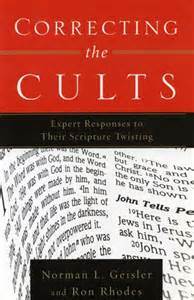 Norman Geisler and Ron Rhodes, Correcting the Cults, p. 166-167. Sunday Praise: "The Cross Has the Final Word"